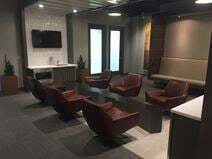 Within three miles of both the Brigham Young University campus and Utah Valley University's campus this exquisitely furnished and highly contemporary business center is ideally placed to take advantage of the local talent pool and provides office space suitable for teams of one to five people. For travel further afield and internationally, Salt Lake City International Airport (SLC) is around 40-minutes' drive from the center. Close to government buildings this range of flexible office space provides a premier business address in the heart of Provo"s central business district. The area is full of tech and finance companies with the building surrounded by great local amenities. The local transport links are also excellent, with a number of frequent and convenient services in operation throughout the area, making the center easily accessible.